I had a few pieces of business card sized paper left. Voila! These little paintings are fun to do. This one might look good in a quilt. Jo, the colors made me think of you! I hope you like. Jo makes art out of vinyl 45 records every day at https://dailyrecord365.wordpress.com/ Her art inspires me every time I visit, and always makes me wonder and think and question. All good things, in my book. Good vibes and lots of fun conversation to be had at her place! Happy Sunday. Flinging peace and joy to all who read this! Splish splash in purple puddles, wouldja? Gorgeous! Almost thought it was a photo. Ocean looks so real. So much detail in a tiny painting. Blows me away. Wow, thanks! It was so much fun to do! Small is easier. I don’t know, less pressure. Seems like it would be harder – for some reason – I think bigger is easier…. why is that? For me, small removes the pressure of composing and layering and making a real picture out of it. For you, it may really be easier! But these little paintings are easy for me. Bigger just feels more …. official and like I should know what I’m doing before trying it. Pressure. It’s all about the head though. Maybe I could talk myself out of it. Also, I get sick of things quick, so I like small pieces because I’m finished way before I get tired of it! I’m not bold and expressive yet. Baby stepssss. lol. Fantastic reflections in the water! Nicely done. Wow, thank you, Wayne! I appreciate that! You are totally, absolutely rocking this! Wow, thanks Rebecca! I had no idea this painting would get such great feedback! Thank you again! C, if I were going, I would! I miss the beach huge, and painting lots of beachiness lately. Or trying. Lovely colors in a beautiful painting! It really looks like a stormy sea! Thank you, Teresa! It was fun! I’m glad you like it. At one point, I was rinsing the sky right under the tap in the sink. I’m amazed at what good paper tolerates. I could do these little paintings forever. That is terrific. You are really good at that. Your use of light is so realistic. Wow, thanks Kirk! The reflections on the water are very easy to do with a dryish brush on cold-pressed paper (textured). It was fun to mix in the blues and greens I had leftover on my palette. I wish I could show you how easy this was. You’d be dashing out loads of them. This kind of thing is really fun to do. I’m glad you liked! Thanks for your kind comment. Thank you, Beth, and I do hope you return to drawing and painting. I never knew you had done those things. Photography and painting are such wonderful gifts to have, as they feed each other. I actually do like this painting. I didn’t at first, but as it dried I liked it more and more. I may do a little series of these while those greens and blues are in my palette! I do hope you share your drawings/paintings, if you resume. Your flowers would be lovely subjects. You have really captured the feel of the water, it’s gorgeous. Thanks, Inari, I really appreciate that! It’s so nice when a painting I like is appreciated by others too. These small paintings are really fun! Gorgeous! The colours are beautiful. Like inari said, you captured the feel of the water… and the sky. I felt an instantaneous connection to the sensation of looking at endless ocean and sky… the feeling of the wind and the sun, the smell of salt. Thanks :-). Thank you so much, Lance! And thanks as always for the inspiration. I’m really glad you Iike this one. Thanks! Jill, it was just drybrush technique. Really really easy. If I had to paint whitecaps on these little paintings I’d go blind and crazy, and not sure which one first! I’m glad you like it. I actually do too. Thanks again. I’m so glad you love it, Jo! Would you like one? This has your name written all over it. I was gonna try and make more. I can’t ever seem to duplicate watercolors but if you’d like one, I’ll try it! That’s so generous of you. How could I say no to that offer? It’s funny that you say it has my name written all over it. When I saw it in my “reader” with any text, I got VERY excited. I loved it immediately. Don’t try to duplicate though. Seems like that would go against the nature of the medium and end up looking duplicated. Of course I would love one, but I’m enjoying your work from a far as well. Thank you! I’m seeing this 5 days later. Sorry for the delay. Thanks. We like it too. Once someone knocked on the door just to ask if “musicians live here?” That was without any records on the steps, simply because of the blue and purple. 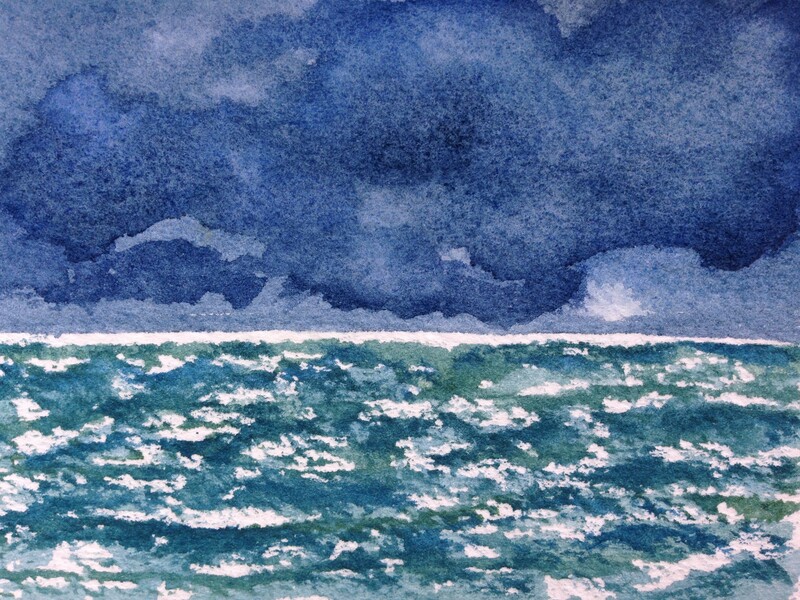 The sea, the sea…you’ve solved the painting-of-it problem. I’m hoping to make an attempt one of these days. Good inspiration. Looks just like the view from the shoreline as I drove by in the early evening yesterday . . . . Really makes you feel like you’re at the ocean. Thanks so much for your comment! I just found it stuck in the spam folder. I’m so glad you enjoyed the painting. Stay tuned; hopefully there will be more soon! It happens to mine too!! The WP phaser gun. Great job capturing the choppy water. I struggle with water and often overdo it. Thanks! Water is tough. Drybrush seems to help me with the sparkle. Sometimes I think with water simple is better. Too often I overdo it and try to paint every little shadow and wave. I think you’re right. I’m starting to wonder if I overthink lots of things (and overwork, too). Great depth and colour I can almost imagine myself there. Thank you! This painting’s getting great feedback. I’m really glad you like it!